Today we celebrate Our Lady's appearance to a young peasant girl, Bernadette, in 1858 in Lourdes, France. Through a set of private revelations, Mary revealed herself as "the Immaculate Conception." What does this title mean, and what should we know about Our Lady of Lourdes? Ellyn von Huben explains. Bernadette is a perennial favorite when young ladies chose their confirmation names. And girls certainly do love watching the film version of “The Song of Bernadette”. (Winner of the very first Golden Globe award for best motion picture, by the way!) I wouldn’t say that watching this movie was the thing that led to my conversion…but it sure didn’t hurt! Our Lady did not appear at Lourdes just to touch the hearts of tween girls throughout the ages. There is, indeed, much that speaks to the heart of the young girl. But anyone, of any age or gender can find in the story of St. Bernadette a story that will resonate truth within their hearts. The appearance of Our Lady at Lourdes was not just for Bernadette – it could be heard by all; a sign for all pointing to Our Lady’s son, Jesus Christ. Much is being discussed on Catholic internet sites regarding the state of modern catechesis and how it should be improved. St. Bernadette could be called a product of poor, minimal catechesis. But Bernadette started her faith life the best way possible – whether for a provincial child of the 1850s or a very modern, prosperous young person. She was the product of a strong “domestic Church”. She had the minimal schooling of a poor girl of her time, compounded by missing lessons due to ill health and the fact that she was needed at home to help care for siblings. To the chagrin of the teaching Sister preparing her for her First Holy Communion, Bernadette was a technically abysmal Catechism student. But she received the most important preparation – that which can hardy be replicated in a classroom – being raised in a family whose greatest riches were their faith. There is profound understanding in this heart which would one day write, "I was nothing, and of this nothing God made something great. In Holy Communion I am heart to heart with Jesus. How sublime is my destiny." It was the young Bernadette’s lack of schooling which made her testimony regarding the apparitions all the more believable. The dogma of the Immaculate Conception had been defined by Pope Pius IX just four years before Bernadette’s visions. The quote “I am the Immaculate Conception” coming from the lips of a young, rural girl possessing minimal scholarship had an indisputable veracity. The appearance of Our Lady to Bernadette is considered to be private revelation and adds nothing to the public deposit of faith – and so no Catholic is obligated to believe. The millions of believers, Catholic and non-Catholic, who visit Lourdes each year are, though, a testimony to the fact that those who do not believe in Our Lady’s appearance at Lourdes must be something of a minority. A variety of authors wrote about St. Bernadette and the apparitions at Lourdes. But 20th century cultural popularity of St. Bernadette owes much to “The Song of Bernadette” and the efforts of its author. Franz Werfel, a Jewish German writer found himself in Lourdes while trying to escape to Portugal after France fell to the Nazis. Families who took in Werfel and his wife told them the story of Bernadette and her visions of Our Lady. Werfel vowed that if they should be able to escape, he would write the story of St. Bernadette. True to his promise, his first task when arriving in the United States was to write the beautiful work of historical fiction (which is more historical than fictional), The Song of Bernadette. An interesting bit of trivia: the structure of this bestseller is itself a reference to the holy rosary – five sections of ten chapters each. Lourdes has had a special place in the hearts of many popes in the past 156 years. 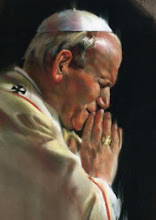 Blessed Pope John Paul II made three pilgrimages to Lourdes. He also proclaimed February 11, the feast of Our Lady of Lourdes, as World Day of the Sick. Culminating his years as Pope, serving with “inner joy and generous commitment”, it was on February 11 of last year (2013) that he took the unprecedented (in modern times) step of announcing his stepping down from the papacy. Those who are looking for lessons in humility - and shouldn’t we all? - can find multiple examples in the story of St. Bernadette. From Bernadette and her humble, devout family, to the Church and civic officials, all the way to her teacher – who learned her lesson rather late – there is great food for contemplation in the stories of those characters who surrounded the young saint. Be they actual persons or fictionalized composites, they are all studies in growth in humility. When she was 22, she joined the Sisters of Charity of Nevers. She was content to be apart from public life, regarding herself as a tool, such as a broom, which had served its purpose and then “the broom placed behind the door once it has been used.” The teacher who had been harsh to her in her student years was to be her novice mistress and as harsh to the young sister as she had been to the student. It was not until this nun realized the sanctity with which Bernadette was bearing her final affliction of tuberculosis of the bone that she realized what a truly holy young woman she had been privileged to teach and guide. Despite her agony, Bernadette declined the opportunity to revisit Lourdes in search for a miraculous cure. Pope Saint Pius X established the Lourdes Medical Bureau to investigate cases of medical miracles. This Medical Bureau is a medical institution and not under Church supervision. Over 7000 people have asked to have their cases declared as miraculous cures, yet fewer than 70 been signed off on by both the Church and the Lourdes Medical Bureau as being cures with no scientific explanation. Because this system for rigorous investigation was established early and openly, verified miracles from Lourdes are considered to be the most reliable and least controversial. If you are suffering or merely curious, a pilgrimage to Lourdes may be just what you are looking for. Volunteers of all sorts, not only medical professionals, are needed to help in a variety of ways, including helping the sick prepare for their opportunity to bathe in the water of Lourdes. A week of time given in love brings its own miraculous gift to the hearts of those who spend time with the ‘malades’ on their pilgrimages.